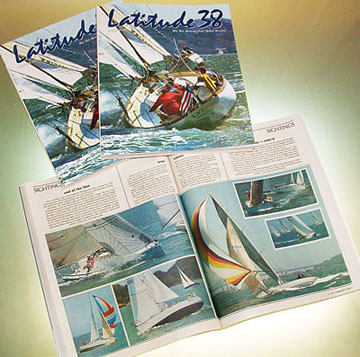 Today's Photo of the Day is of the new issue of Latitude 38, which gets distributed in Northern California today. The July 2005 issue is our first one with some four-color ads and editorial photographs on the inside. We hope you enjoy it. 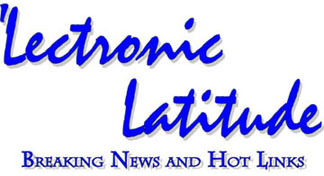 In Wednesday's 'Lectronic, we reported that a Vancouver newspaper had reported that Jeff Berwick's Vancouver-based 10.5 meter Katatomic II had broken up and sank in a storm off El Salvador, and that he and his partner survived by clinging to one of Berwick's surfboards. Regular newspapers rarely get sailing stories right. The news that the cat had allegedly broken up and sank came as a shock to Jim Cash of Marina del Rey, who had sold the South African-built Wildcat 35 to Berwick. After all, Cash had sailed Katatomic I, a sistership, all the way from South Africa to Los Angeles, and had sailed Berwick's cat from Tortola to Los Angeles. Then Berwick sailed Katatomic II to Vancouver, and then south to El Salvador. In other words, this was a design with a lot of ocean miles without any structural problems. Cash couldn't figure out how she could have broken up at sea in a storm. "A few days ago the 42-foot (sic) catamaran Katatonic was caught in a 50-knot squall while trying to cross the bar south of here, and was driven onto the rocks and destroyed. The crew was found drifting, hanging onto half a surfboard. But the cat sank and was a total loss. It's a grim reminder of how careful we need to be, and how it is safer to head to sea during a violent storm rather than trying to seek refuge at a dangerous entrance." As we understand it, the entrance being discussed is the ocean bar that needs to be crossed to reach the estuary that leads to the Bahia del Sol Hotel. Mariners have always been told not to cross this bar alone, and to wait until a guide comes out in a panga. We have an unconfirmed report that Berwick and crew tried to cross without a guide, after they were told it had gotten too dark to attempt a crossing. 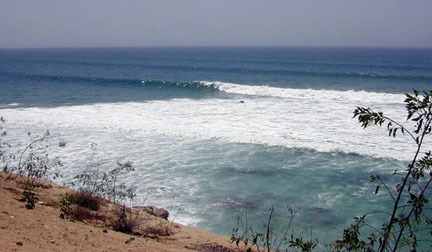 Mike Miller, who cruised Mexico aboard the Vanguard 33 Uhuru, and who more recently bailed from Ventura to live at the Cape, enclosed the following shot of the great surf at The Rock, near Cabo San Lucas. He says the water has only now just gotten warm enough to surf for hours without a wetsuit. Fortunately, nobody was killed and only about 20 recreational boats were destroyed yesterday morning when the 7,000-ton B.C. Ferry Queen of Oak Bay smashed into Sewell Marina next to the Horseshoe Bay terminal in West Vancouver. There was some sort of mechanical failure on the ferry, which oddly enough, had just come out of a massive refit two weeks before. The 544 passengers had been warned of the impact far enough in advance so that many were able to run to their cars and strap themselves into their seat belts. As it was, the impact was reported to be no harder than a normal ferry docking. Recreational boats seemed to make an ideal cushion. At least three people aboard a 40-ft powerboat suffered broken bones Wednesday night when it slammed into the wood and concrete Hunters Point Pier at the foot of J Street in San Francisco. According to investigators, the boat was doing about 20 knots when it slammed into the pier. The cause of the crash is under investigation. Because the 29er is one of the fastest and most thrilling dinghies in the world, many of the planet's best skiff sailors will be at the host St. Francis YC for the Sixth Annual 29er World Championships. 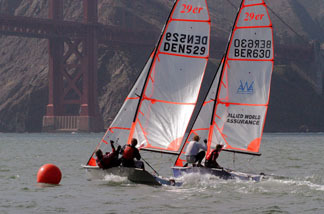 Among the local teams competing are: Jen Morgan of Alameda, a four-time all-American, with Anthony Boscolo; John Heineken of Tiburon and Matt Noble of Richmond; Brooks Reed of Santa Cruz and Brian Maloof of San Mateo; Myles and Morgan Gutenkunst of Mill Valley; and Marcus Bernal of Santa Barbara and Jonny Goldsberry of Marin. The regatta features a 'Bridge to Bridge' race on the 4th at 5 p.m., but otherwise daily races on all but Tuesday. Check 'em out! "After a bit of time had passed," writes Nancy Tompkins aboard the Mill Valley-based Wylie 39 Flashgirl, "I was surprised to see King Neptune's messenger - Commodore Tompkins, my husband - approaching me from the foredeck. He was waving his trident, and wearing a cape and crown. He announced that King Neptune, his lord and master, had sent him to deliver a parchment to me, which welcomed me to the southern half of his realm. Duly I have been officially recognized as a shellback, on the last day of June 2005. "Well, I was both surprised and delighted by this impromptu visit. And I think you would all be in stitches if you had seen Commodore's portrayal. He had managed to make a crown from an old chart and some foil, was wearing our Hood Sails bag for a cape, and had made the trident from battens to our #3 sail, along with the long scrub brush handle. Of course, the trident had the fanciest tassels and turban knot that one will ever see. "So, this is how our first day in the southern hemisphere began. We have had a mixture of sunshine and rain squalls, and right now it is raining - our first day of rain on the trip. We left San Diego on June 15, and here it is the end of the month, so it's taken us exactly two weeks to get from California to the equator. I have just used the last of our apples to make an apple crisp, so the cabin is full of its fragrance. We're continuing to have a wonderful time."